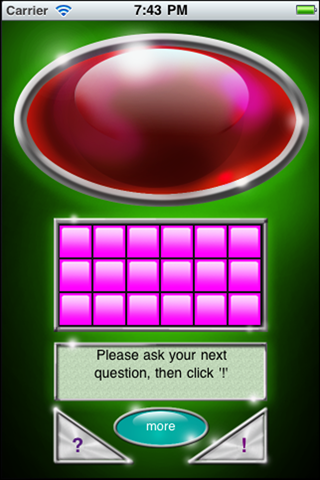 Above is the default user interface for Ask a Computer. 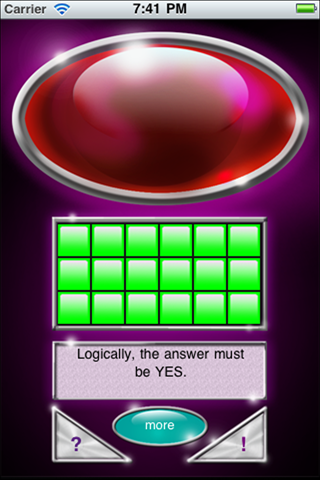 Ask A Computer lets you ask an intelligent device your "important" questions! Let the "Computer" decide those difficult and uncomfortable decisions for you like, "Should I order the burger or the pizza?" Or maybe, "Should we see a movie tonight or go to dinner?" Over 200 answers in all! You can trust this device. . . it's a computer! Well, you may NOT be able to actually trust it, but it is hilarious. Have fun with the different types of responses, or use the "All Responses Combined" category to be totally surprised as to what type of answer will pop up! 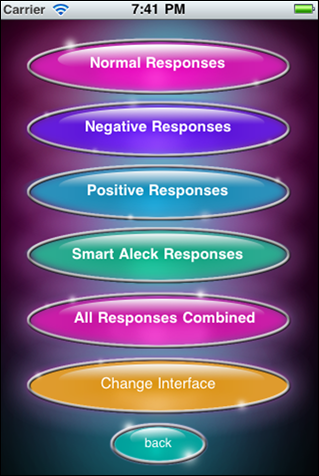 Choose from six different colors for the interface to reflect your mood! Do you feel red and saucy, or blue and laid-back? 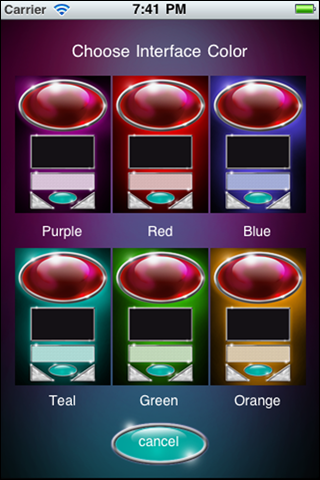 Select the color that you want to interact with. When your mood changes, change the color! Lots of great sounds too! Each time the Computer provides its wisdom, an interesting sound plays to help set the mood. Responses from logical, to illogical. . . from idiotic to sublime! This game has it all. It is just a game after all. . . . OR IS IT?????? If you are experiencing problems with Ask A Computer, try deleting it from your phone and re-installing. You can either sync your iPhone with your computer to reinstall Ask A Computer, (if you have run a sync with your phone with your computer AFTER installing Ask A Computer the first time), or download it again from iTunes. You won't need to pay again, as iTunes will remember you have previously installed it. 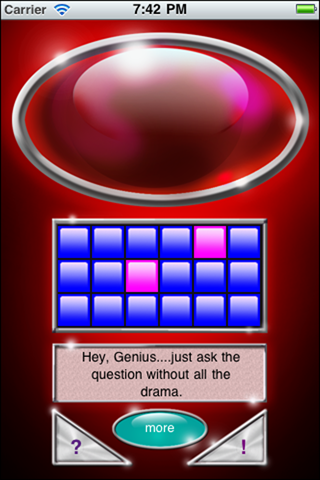 The menu to change the type of answers and the interface color. The menu to change the interface color. Six colors to choose from. The red interface. One of six colors to choose.